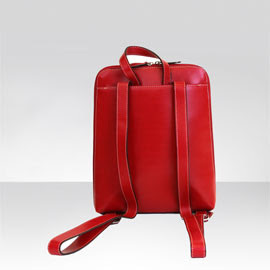 This slim, sleek backpack is called Audrey City Backpack made by Lodis. It is of quite simply, chic timeless beauty, refined and elegant characteristics. Audrey features smooth grain leather, contrasting trim and interiors. Always available in traditional Black and Red. Features: Gusseted interior main compartment, Padded outside zippered compartment with key holder and two pockets, Carry handle and adjustable straps. Lodis is established in Spain in 1965 and transplanted to the U.S. It combines downtown style and refined materials in its line of fashion accessories, from handbags and totes to small leather goods and evening clutches.